A battle rages between phytoplankton and viruses in the ocean. On June 15, an international team of scientists will embark on a voyage on the North Atlantic for 30 days to study this war. They’re interested in how this battle affects the movement of carbon – the most important building block of life on the planet and a regulator of climate, and sulfur – an element that helps form clouds – through the ocean and atmosphere. These scientists will be using remote sensing data from satellites and autonomous gliders, molecular techniques, and other water property measurements. Scientists including Kay Bidle from Rutgers University, Ben Van Mooy and Marco Coolen from Woods Hole Oceanographic Institution, Jack DiTullio from the College of Charleson, and Assaf Vardi from the Weizmann Institute of Science, are interested in learning more about how these viruses infect their phytoplankton hosts. Phytoplankton are single celled plant-like organisms that make up the base of the marine food web. They’re photosynthetic, meaning they capture energy from the sun and convert it into food. Like plants, these little guys fuel the whole food web by serving as a food source for other marine organisms. During this research cruise, the scientists will focus on one major group of phytoplankton: coccolithophores. Coccolithophores are unique because they surround themselves with microscopic plates, which are shaped like hubcaps and are made of limestone (calcite). This, along with their ability to photosynthesize, makes them an important link in the global carbon cycle. 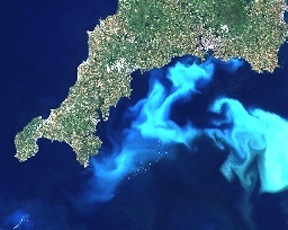 In addition, coccolithophores are major producers of dimethyl sulfide, which helps form clouds. Although very small, coccolithophores can appear in the ocean in great numbers and aggregate in blooms. In fact, when there are trillions in an area, the water can look turquoise in satellite images of the ocean. 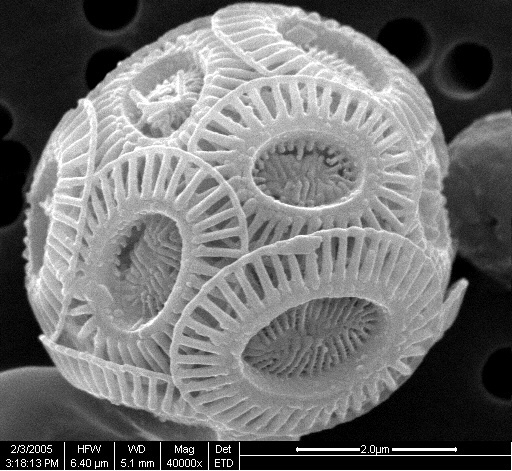 On this research cruise, the scientists will focus on one particular species of coccolithophore, Emiliania huxleyi. Viruses are the most abundant and may be the most diverse biological material found in the world’s ocean. When viruses make their way into a host cell, they are able to use the host cell machinery to replicate themselves and form more viruses. Viruses that cause the host cell to rupture during this replication process are referred to as lytic viruses. Kay Bidle and his colleague Assaf Vardi have been studying a strain of lytic Coccolithoviruses and the pathway(s) that viruses use to cause the phytoplankton host E. huxleyi cell to rupture through a process called programmed cell death (PCD). In laboratory experiments, they have discovered a unique class of glycosphingolipids (GSLs) that these viruses produce during infection. These GSLs allow the viruses to hijack the host’s PCD machinery. When enough viruses have been produced and the GSLs reach a critical threshold concentration, the PCD machinery is activated, thereby killing the E. huxleyi host and releasing new viruses into the environment. This may seem like the end for these hosts. However, the E. huxleyi host can produce its own molecules, at the same time, that prevent the virus from making the GSLs and replicating. This protects and immunizes the hosts from infection by the virus. It is the balance between this molecular ‘arms race’ that will serve to regulate the outcome of this ‘microscopic war’ at sea. In the North Atlantic, E. huxleyi forms large annual spring blooms. Infection by these viruses is a primary cause of rapid bloom termination. Because of the impact of E. huxleyi on the global carbon and sulfur cycle, it is important to understand the factors that lead to the demise of these blooms. The scientists will be using remote sensing and gliders to chase E. huxleyi blooms prior to viral infection. Water containing E. huxleyi and viruses will be collected to monitor bloom progression and for shipboard incubations. The goal is to perform experiments that will allow the scientists to follow what happens when Coccolithoviruses attack, manipulate and rewire their phytoplankton host. They will also be looking at the strategies these two groups use to fight each other and how the viruses and their phytoplankton hosts are co-evolving to survive. On the ship, the science team will be using an array of molecular biology, biochemistry, lipid and microscopic markers to determine whether phytoplankton populations are infected. The data collected will help determine the influence of bloom growth and demise on the contribution of E. huxleyi on global carbon and sulfur cycles. For more information and updates on this cruise and the science, follow along with the Scientific American blog. This was absolutely fascinating to read. I’m looking forward to checking back and seeing what they find. This sounds like another “Educators Night” topic for M.A.R.E. educators… hint hint. I have already suggested to Kay that he will have an open spot in our Educator night program. Thanks for your comment. COSEE NOW friends – Please take a moment to check out the Scientific American blog, North Atlantic VICE’ (North Atlantic Virus Infection of Coccolithophores Expedition) by Rose Eveleth. We just found out the blog has been picked by by Yahoo News. 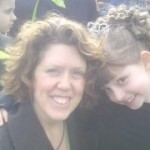 Lots of great and entertaining posts so please check it out — http://news.yahoo.com/stay-sane-ship-middle-ocean-150000857.html.